(MENAFN - The Conversation) From a great distance, our Milky Way would look like a thin disc of stars that rotates once every few hundred million years around its central region. Hundreds of billions of stars provide the gravitational glue to hold it all together. 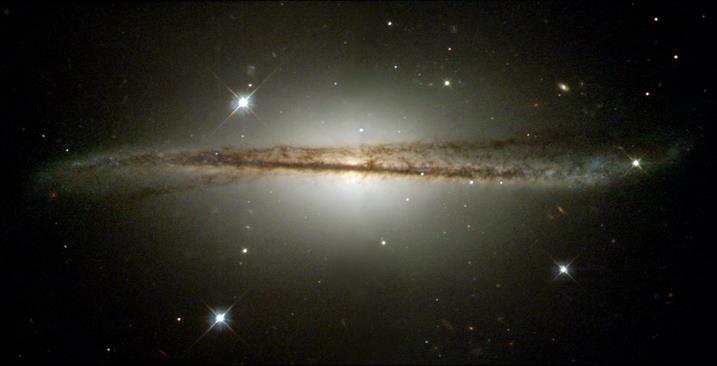 But the pull of gravity is much weaker in the galaxy's far outer disc. Out there, the hydrogen clouds that make up most of the Milky Way's gas disc are no longer confined to a thin plane. Instead, they give the disc an S-like, warped appearance. Although the Milky Way's warped hydrogen gas layer had been known for decades, in research published today in Nature Astronomy , we discovered that a disc of young, massive stars there is warped too, and in a progressively twisted spiral pattern. We were able to determine this twisted appearance after having developed the first accurate three-dimensional picture of the Milky Way's stellar disc out to its far outer regions. While that is not particularly difficult in directions above and below the stellar disc plane, it becomes much harder along the Milky Way's plane. Other than stars and hydrogen gas clouds in the Milky Way's plane, our view is obscured by huge quantities of dust. The material astronomers call dust is made up of carbon particles. It is not too different from the soot that builds up in your home if, for example, you have an open fire. But it's not just the presence of dust that makes mapping our Milky Way galaxy troublesome. It is notoriously difficult to determine distances from the Sun to parts of the Milky Way's outer disc without having a clear idea of what that disc actually looks like. One of the researchers in my international team – Xiaodian Chen of the National Astronomical Observatories (Chinese Academy of Sciences) in Beijing – compiled a new catalogue of well-behaved variable stars known as classical Cepheids . These stars vary in brightness over a period of time. Our new catalogue was based on observations made with NASA's Wide-field Infrared Survey Explorer ( WISE ), a space telescope fitted with long-wavelength (infrared) glasses, ideal to look through any dust in the Milky Way's disc. The Cepheids mapped range from the Milky Way's centre to its outer regions with most on the near side of the centre of our galaxy because of observational limitations. Cepheids show day- to month-long pulsations, which can be observed quite easily as changes in their brightness. Combined with a Cepheid's observed average brightness, the period of its pulsation cycle can be used to obtain an accurate distance. Somewhat to our surprise, we found that our collection of 1,339 Cepheid stars and the Milky Way's gas disc follow each other closely. Until our recent study, it had not been possible to tie the distribution of young stars in the Milky Way's outer disc so well to the flaring and warped disc made up of hydrogen gas clouds. Combining our results with these earlier observations, we concluded that the Milky Way's warped and twisted spiral pattern is likely caused by forced torques from the galaxy's massive inner disc. The rotating inner disc is, in essence, dragging the outer disc along, but since the outer disc's rotation is lagging the resulting structure is a spiral pattern. This new map provides a crucial update for studies of our galaxy's stellar motions and the origins of the Milky Way's disc. This is particularly interesting given the wealth of information we anticipate to receive from the European Space Agency's Gaia satellite mission . Gaia aims to eventually map our Milky Way in unprecedented detail, based on the most accurate distance determinations to the galaxy's brightest stars ever obtained.